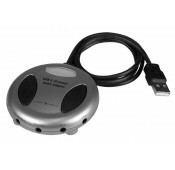 The USB 5.1 Channel Audio Adapter plugs into your USB port and provides everything you need to connect your home theater system to your laptop or PC. Provides both stereo and surround sound outputs. Rear audio, center/sub woofer, and front audio channel outputs, as well as one mic-in port and one line-in port. Control volume with the buttons on the adapter. Improves a computer's audio playback quality. Eliminates audio noise and distortion. 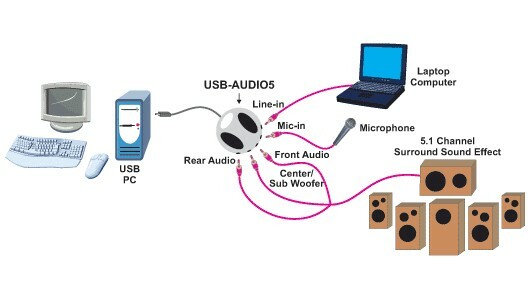 Full-duplex playback/recording audio stream without the use of a PC sound card. Supports suspend/resume and remote wake-up. Supports fixed 48KHz sampling rate in analog recording and playback.modes.